In the Environmental Impact Statement (EIS) under which the Army Corps of Engineers (Corps) currently is operating the dams, breaching the four lower Snake River dams is specifically set forth as a reasonable mitigation measure to achieve salmon survival and recovery. Breaching beginning this year would fully comply with the Portland district court’s decision in Nat’l Wildlife Fedn v. Nat’l Marine Fisheries Serv., No. 3:01-cv-00640-SI, 2016 U.S. Dist. LEXIS 59195 (D. Or. May 4, 2016) (NWF v. NMFS). The Corps is within its authority to breach the dams now, since the economic benefits are far below the costs (benefit to cost ratio of .15, meaning 15 cents in benefits to every tax dollar spent); and there is a working EIS in place, the 2002 Lower Snake River Juvenile Salmon Migration Feasibility Report/EIS (2002 EIS). The 2002 EIS resulted from a seven year, $33 million comprehensive study focused on the four lower Snake River dams. It includes the reasonable alternative of breaching the dams to improve fish survival rates through the lower Snake River. For the better part of three decades, the best available science has established that dam breaching presents the greatest biological potential for recovering endangered and threatened wild lower Snake River salmon and steelhead that are listed under the Endangered Species Act (ESA). By 1999 the National Marine Fisheries Service (NMFS, aka NOAA Fisheries) had determined that to recover ESA listed Snake River spring/summer Chinook, the most risk averse action would include dam breaching, a harvest moratorium, and vigorous improvements in habitat and hatcheries. By 1999 NMFS’ results demonstrated that for the ESA listed Snake River fall Chinook and steelhead, dam breaching by itself would likely lead to recovery. By 2002 the Corps knew that it was necessary to breach the four dams to recover the ESA listed lower Snake River salmon runs. The Corps’ analysis showed that breaching the dams had the highest probability of meeting the government’s salmon survival and recovery criteria. In comparison, the other so-called “reasonable” alternatives would be slightly worse than doing nothing. Nevertheless, the Corps implemented the “slightly worse than doing nothing” alternatives and has been on a spending spree since, wasting approximately $1 billion of ratepayer and taxpayer money on hardware improvements and juvenile transportation around the dams. Predictably, the four Snake River ESA listed runs are in worse shape today than in 2002. The federal court’s decision in NWF v. NMFS is the strongest rebuke yet of the federal government’s operation of the Columbia River Basin hydrosystem. The entire thrust of the opinion is to persuade the executive branch of the government to breach the lower Snake River dams, as a major fix to the salmon-killing hydropower system the government has created. See id., at 19-20. In that case the Court correctly observed that while the 2002 EIS was relevant to operation of the hydrosystem, it was “too narrow” to cover the 73 Reasonable and Prudent Alternatives (RPA’s) in the 2014 Biological Opinion. However, the 73 RPA’s were not limited to the lower Snake River, but instead were proposed to occur throughout the Columbia Basin. None of the RPA’s included dam breaching, while all were required to work in order to avoid jeopardy to the 13 ESA listed salmon and steelhead runs in the entire basin. Thus, the 73 RPA’s were completely interconnected and encompassed far more than the Snake River. 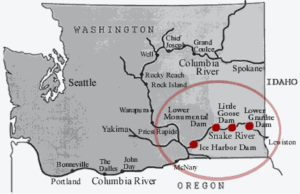 In contrast, the 2002 EIS fully covers the lower Snake River and the four lower Snake River dams. The Corps prepared the 2002 EIS specifically for the lower Snake River to plan for fish passage and survival, and to mitigate the environmental impacts of the four dams. Dam breaching is the fourth reasonable alternative set forth in the 2002 EIS, and is the only alternative that has not been tried. Moreover, breaching complies with the intent and spirit of the Court’s decision in NWF v. NMFS. Indeed, the entire opinion points in one direction—that breaching the four lower Snake River dams likely both will save billions of dollars in taxpayer money and prevent Snake River salmon extinction. It is precisely “the reasonable alternative of breaching, bypassing, or removing one or more of the four Lower Snake River dams,” on which the Court implored the federal government to act. See id., at 136. Breaching is also the hydropower mitigation measure that maximizes the focus on salmon recovery, as the court wanted, rather than hydropower generation. See id, at 18-19. Notably, the criticisms leveled at the federal agencies in NWF v. NMFS do not apply to the 2002 EIS, since it fully discussed the ESA listed species, and thoroughly studied dam breaching. Moreover, returning the lower Snake River to a near natural flow resolves most of the issues created by the four dams. Even the effects of climate change are best mitigated by dam breaching, since near natural flows, elimination of the warm slack water reservoirs, and restored habitat would return the lower Snake River to a natural temperature regime under which the salmon evolved. Further, the dams and reservoirs inflict down and upstream mortality on salmon and steelhead. This results in far less utilization of the high altitude spawning habitat in Idaho that is the refuge most capable of withstanding the predicted effects of climate change/warming. Wild lower Snake River salmon and steelhead are keystone species in the Pacific Northwest. Given their critical importance to the Columbia Basin ecosystem, the Corps must act now to draw down the reservoir behind Lower Granite Dam. Without that action, it is likely the wild salmon and steelhead will be lost, and no amount of future recovery efforts or money will bring them back.